Dementia is said to be the cruellest disease because it causes two deaths: The slow extinction of the personality, followed by departure from life. In 2016, dementia became the leading cause of deaths among females, surpassing even heart disease. 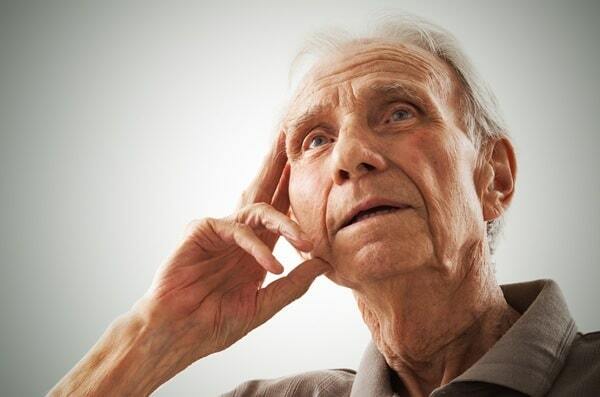 About 10% over-65s, 30% of over-85s, and 52% of aged-care residents have dementia. Dementia is the single greatest cause of disability in seniors and the 3rd leading cause of disability burden. If your family member has dementia, you CAN make a huge difference. Read on. Supporting a parent with dementia can be difficult and traumatic, but it can also be rewarding. University of Pittsburgh scientists Dr T. Inagaki and Dr. E. Orehek identified in a 2016 CDPS article that when support is perceived to be effective, the support can also benefit the caregiver, leading to reduced stress, increased happiness, and increased sense of social connectedness. It can even forge a powerful influence on your outlook. This article will convince you that your social engagement with your loved one can reduce dementia or prevent dementia onset. Web-based face-to-face conversation has been shown to demonstrably improve cognitive ability in as little as 6 weeks. A randomized study showed that web-based face-to-face conversation significantly increases cognitive function in as little as 6 weeks. The average age of participants was 80.5 years old. In contrast, the control group, who had audio-only telephone interactions once per week, did not experience the improvement. This result suggests that video conversation could enhance cognitive functions and delay the onset of dementia. The research paper detailing the ground-breaking conclusions was published in 2015 and co-authored by leading scientists from the Oregon Health and Science University, the University of Michigan, the University of Miami and the Portland Veterans Affairs Medical Center. Participants were assessed on a recognized dementia metric called Clinical Dementia Rating (CDR). They measured between 0 and 0.5 on the scale, where 0 is considered normal (for age) and 0.5 is categorized as Mild Cognitive Impairment (MCI). Half the participants were selected without dementia (CDR = 0) and half the participants were selected with mild dementia. “Before and after” cognitive test scores and loneliness scores were compared between the intervention group and the control group. Adherence to the daily conversation routine was very high, with 77% to 100% daily compliance (average: 89%). There were absolutely no drop-outs whatsoever. To help achieve such a high level of adherence, a large touchscreen monitor and a user-friendly interface were given special attention. The authors noted that compared to other stimulation methods, such as game-invoked cognitive training, face-to-face conversation is more natural, more engaging and requires less motivation. The participants with MCI (mild dementia) improved in their psychomotor speed using assessments that included the Cogstate detection tests, as well as the trail-making A test. The cognitively intact participants (those without dementia) improved significantly in the semantic fluency test taken at 6 weeks (immediately following the trial). The improvements also proved to be durable, as measured by the phonemic fluency test taken at 18 weeks (12 weeks after the end of the trial). The resulting enhancements in language-based executive brain function suggest that web-based face-to-face conversation can be used as a cost-effective technique for home-based dementia prevention. Web-based conversation works — and shows results after just 6 weeks! This is great news for family members too far away to visit, too busy, lacking the resources or unable to travel often. Just 30 minutes a day of face-to-face time was shown to be effective. So, for example, video calls twice a week, with each of 3-4 family members, is all it takes. Those with and without dementia benefited. If you have elderly relatives living alone or within a facility, don’t wait until memory loss starts. Audio-only interaction does not produce the same benefit (we explain why below). We suggest to “trade-up” or augment the regular telephone with a video phone. Published studies indicate that with age, emotional motives help drive engagement and enhanced outcomes. This suggests that video conversation with family and friends, compared to conversation with staff and strangers, is much more likely to ensure adherence and positive results. The more, the better. Recent MRI studies link the size of social networks with the density of gray matter and with amygdala volume. This suggests to setup as many family and friends as possible to take part in video conversations. 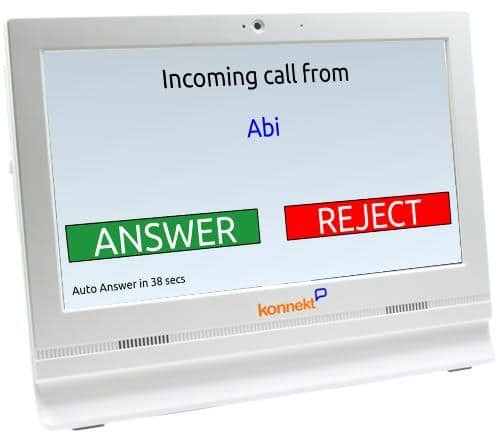 A large touch-screen user-friendly interface is key to acceptance and adherence. Most seniors facing dementia would struggle with an iPad or tablet. A user-friendly device is therefore required, such as a video phone designed specifically for the elderly and those with dementia. The authors of the study suggest that user-friendly video conversation is a useful prevention approach against cognitive decline and dementia. The study was led by Professor Hiroko Dodge at Oregon Health & Science University (OHSU) and University of Michigan and was funded by the National Institutes of Health (NIH) in the USA. Read the abstract and download the original paper. Konnekt has witnessed similar results first-hand (but not in a controlled study). We believe that this will revolutionize the way we care for our elderly relatives — both those who live independently as well as those within residential aged care. The results of the above study were so positive that Dr. Hiroko Dodge and her colleagues are currently conducting 2 new follow-up studies to measure the long-term health outcomes. These studies are quantifying the impact of face-to-face web-based conversation on the delay in Alzheimer’s Disease (AD) onset and the delay in cognitive decline of seniors with MCI (Mild Cognitive Impairment) over 5 years. The studies are also funded by the National Institute on Aging, a division of the U.S. National Institutes of Health. Related research: Read summaries, download original papers, and see our own 2018 conference presentation on Elderly Social Isolation. Healthy diet: Cut sugary foods and refined carbs. Limit processed foods. Avoid trans fats. Increase omega-3 fats. Enjoy fruit and vegetables. Drink 2-4 cups of tea daily. Keep alcohol to a minimum. Why it works: Being overweight doubles Alzheimer’s risk. Correct diet can reduce inflammation and insulin resistance, which injure neurons and inhibit communication between brain cells. Healthy fats may reduce beta-amyloid plaques. Control blood pressure: Get tested regularly and follow doctor’s orders. Why it works: High blood pressure is linked to vascular dementia. Exercise regularly: 150 minutes of moderate intensity exercise a week, combining cardio with strength training. Why this works: Exercise stimulates the brain’s ability to maintain old connections and to form new ones. Quit smoking: Smokers over 65 have an 80% higher risk of Alzheimer’s. Why it works: Improved circulation benefits the brain almost immediately. Manage depression: Identify signs of depression early and consult a health professional for treatment. Why it works: Depression episodes have a physical effect on the brain. Depression is linked to dementia risk. Sleep well: Most of us need 8 hours of sleep. If you snore, get screened for sleep apnea. Keep a regular sleep schedule. Limit naps to 30 minutes in the early afternoon. Avoid TV, computers, mobiles and bright lights in the 2 hours before sleep. Why it works: Poor sleep leads to higher levels of beta-amyloid. Deep sleep is needed for memory formation. Mental stimulation: Learn something new. Enjoy puzzles and games. Practice memorization. Vary your daily habits. Why it works: Like exercise, mental stimulation improves cognitive function. Activities involving multiple tasks or requiring communication and interaction offer the greatest protection. For this reason, social engagement is likely the best form of mental stimulation. Social engagement: Verbal communication with others exercises memory, linguistic skills, attention, executive function and abstract reasoning. Face-to-face communication significantly adds to this by exercising visual processing and pattern recognition, interpretation of facial movements and body language that convey meaning and emotion, and the coordinated use of gestures and movement which are linked to psychomotor skills. We’re more likely to maintain a healthy diet and exercise habit, comply with medication, notice depression episodes, and follow doctor’s orders. We care how we look to our friends; they genuinely care about our health; and socializing often involves grooming, movement and other physical activity. We’re more likely to maintain a good sleep pattern. Keeping social appointments requires staying awake during the day and helps tire us for the night. In summary, face-to-face social engagement is central to dementia prevention and treatment. It exercises key areas of the brain, and positively influences the other major risk factors. Preventing Alzheimer’s Disease. Dementia Australia site. Your Brain Matters. Dementia Guide. Social isolation is linked to depression, poor sleep, high blood pressure, declining functionality and morbidity. Read our easy summaries or download original papers on elderly social isolation. 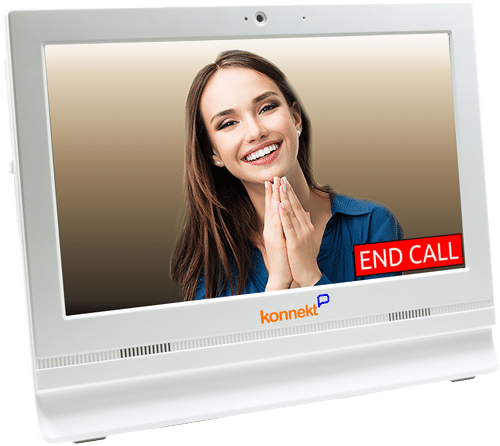 Learn more about Konnekt Videophone. To trial Videophone for your client or family member, simply contact us and we’ll do the rest. From the UK: A University of Exeter study increased the daily social interaction of nursing home residents (who had dementia) from 2 minutes to 10 minutes. This improved wellbeing and had sustained benefits! The study involved 280 residents and care staff in 24 care homes over nine months. This is further evidence of the importance of daily social interaction!